How wonderful that today on Memorial Day Service Cross Medals Stamps debuted at the World Stamp Show-NY 2016. 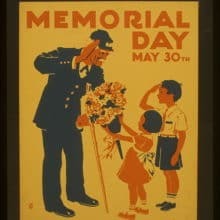 The image upper left is from a poster from 1937 where Memorial Day was also on a May 30th too, although that year it was on a Sunday. The 47 cent Forever stamp comes in four designs and went on sale today by the US Postal Service. The Stamp Announcement 16-15 includes How to Order First Day of Issue Postmark and First Day Covers, other items for sale. “This issuance continues a Postal Service™ tradition of honoring the bravery and achievements of members of the U.S. Armed Forces. Previous issuances have depicted the highest military decoration for valor in combat: the Medal of Honor. Thank you for joining me today for Memorial Day Service Cross Medals Stamps. 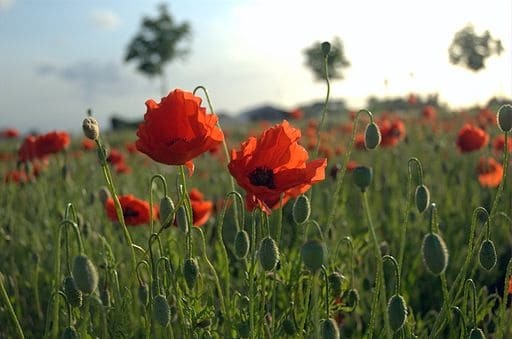 My blog post on Friday included suggesting from last Memorial Day weekend my blog post on the beautiful poem “In Flanders Fields” . For today I’m closing with that poem. Image above upper left by Work Projects Administration Poster Collection [Public domain], via Wikimedia Commons; Poster honoring veterans, showing a boy and an old soldier saluting each other, and girl presenting the soldier with bouquet of flowers. Physical description: 1 print on board (poster) : silkscreen, color. Notes: Work Projects Administration Poster Collection (Library of Congress). ; JCW. ; Date stamped on verso: Apr 16 1937. Image above by Tijl Vercaemer from Gent, Flanders #Belgium). In Flanders Fields the poppies blow (3/3#) [CC BY 2.0 (http://creativecommons.org/licenses/by/2.0)], via Wikimedia Commons.